'All About Presentations' by Jazz Factory: How to cut down excess words from your speech? How to cut down excess words from your speech? We all know we should not be verbose. We should be able to say 'more' using 'less' words. But what if you are by nature verbose? I am actually a person who tends to speak more. I use more words in my day to day conversations (at times I repeat myself as well :-). I write so much in my diary that I need many diaries in one year. Luckily I am not verbose with my slides because I know that doesn't work. If you are verbose by nature and you are giving a speech, you will always end up speaking more. That's your nature and its tough to change yourself overnight. When you speak more, you will speak many not-so-important stuff. How can you then cut down the number of words you use in your speech? There is one technique I know of and its simple. The trick is to condition yourself over time. Force yourself to use less words. Example, If you use a big size notebook or diary, buy a smaller size diary. Something very small like size A6 (around 6 inch by 4 inch). I tried this technique on myself with successful results (so far). 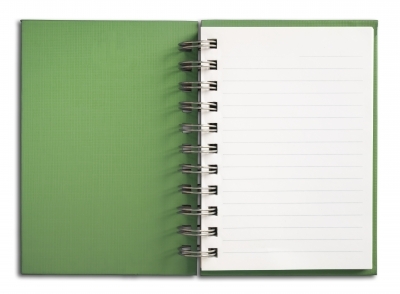 My new green notebook is so small that I hardly have any space to write (I was earlier using those large stylish notebooks). When I now take notes in a meeting or write notes to myself on some topic, I am forced to cut down words to a bare minimum. Thus I end up writing what matters and chop off the not so important stuff. Once your verbosity in writing goes down, your verbosity in speech will also reduce. What technique would you like to use to cut down words from your speech? I think one alternative idea can be Non verbal communication, like instead of chopping off the 'not so important' stuffs we can explain it non verbaly. Interesting. Can you elaborate on this a bit? like, explaining some points with the help of body language & visual effects.. I am still not clear on what are things which body language can explain better? Visual effects, yes but body language?